Thank goodness. It is over. I think the only people mourning the end of what felt like the longest presidential election in history are television ad executives. Between them, the two candidates spent almost a billion dollars on TV ads, concentrated in a few battleground areas. And thank goodness that President Barack Obama was elected to another term. Four years of Mitt and Ann and the Romney boys would have been more than I could stomach. I mean, they named their dog Seamus for crying out loud. Now what? A lot of good-hearted people who were really excited about Obama the Community Organizer in 2008 are now saying that this is the moment we have all been waiting for; that we elected him for his second term, when — unencumbered by the need to get re-elected — Obama can take off the gloves, pick up the standard of progressives, get the economy back on track, end the wars, close Guantanamo and pretty much rock the Oval Office from its long orbit of politics as usual. He promised as much on Tuesday night — telling the cheering crowds “the best is yet to come.” Sounds nice, doesn’t it? I would be happy if it was true, but I am not holding my breath. The best is yet to come? On indiscriminate drone warfare? On Guantanamo? On the global war on terror? On saber rattling at Iran? Let’s just look at drones. The newly re-elected president is going to continue to use drones in Pakistan, Afghanistan, Yemen and who knows where else, even though no one knows how many innocent civilians have been killed by these indiscriminate weapons. How is that possible when we can read a license plate from a thousand miles away, splice a gene and chart a storm? Barack Obama’s Pentagon and the Central Intelligence Agency do not count civilian casualties in the drone war because they don’t want to, don’t think they have to and are counting on the American people to really not care. Sarah Holewinski is the Executive Director of the Center for Civilians in Conflict, which recently worked with Columbia Law School to assess the impact of drone strikes on civilian populations. Holewinski told Danger Room, “nobody knows how many civilians have been killed by covert drone strikes. Nobody — that means the Obama Administration, the Pakistan government, and the media… The Obama administration says civilian casualties are ‘not a huge number.’ If that’s true, evidence could put the debate to rest, but we haven’t seen any.” Their report “The Civilian Impact of Drones: Unexamined Costs, Unanswered Questions,” does not put a number on civilian casualties, but points out the long-term social, political, psychological and economic costs of drone warfare and challenges the Obama administration’s assertions that drone strikes are targeted, surgical, legally justifiable and militarily necessary. Despite all of this, the Obama administration will continue and expand use of drones in its second term. But don’t worry. There will be changes…at least in language. Yep, the same White House that switched from the dramatic and sweeping “Global War on Terror” to the snooze-inducing term “Overseas Contingency Operations” is no longer talking about “kill lists.” That is too direct. Now we get a “disposition matrix.” I feel better already. Hope and change are here to stay. 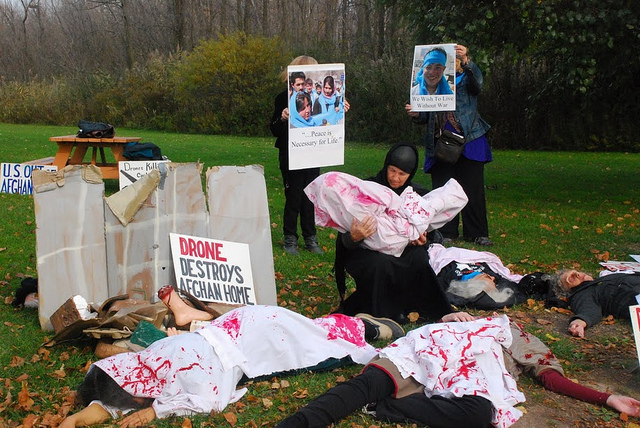 Just days before the election, members of Veterans for Peace, the Catholic Worker and other groups went to Hancock Air Field in Upstate New York, where Predator drones are piloted from. They held signs that read,“We will not be complicit in our government’s war crimes.” Nineteen people blocked the entrances. They were arrested. That’s real hope and change and we are going to need a lot of it in the next four years. I’ve said it before and I’ll say it again: Peace and Justice will not come to this country or the world through the ballot box. Positive social and political change in this country has always come when and only when people have taken to the streets in nonviolent protest. Abolition of Slavery. Womens Suffrage. Trade Unions. Civil Rights. Anti-War. No-Nukes. Nuclear Disarmament. It’s often been that way in other parts of the world as well. The politicians jump on the bandwagon after they see which way the wind is blowing, then they claim credit and re-write history. Obama will not stop the drones. Romney would not have stopped the drones. People like those 19 activists who blocked the entrances to Hancock Air Field in Upstate New York will stop the drones. Come join us in the streets. Stand Up! Sit Down! Boycott! Protest and Survive! Hi Ho! Legacy building–already on Wednesday the pundits started to talking about it. That’s what the next 4 years will be about. And I think Obama has already established drones as part of that legacy. So, Frida, I’m with you and Mike: The people shall lead. Maybe the most heartbreaking part (among many) are the stories from the Stanford/NYU report Living Under Drones. To destroy the peace of mind of an entire village or province or nation? There’s nothing surgical about that. Based on thoughts after 9/11, and occupy, I thought of a presence appearing in each state capitol and W.DC. A simultaneous presence which could be small at first and then increased. Originally I thought of blank signs, again at the beginning, and changing over time with whatever messages desired. The idea would be to display messages of various topics to hopefully garner a growth in numbers. Without a broad-based foundation, will any amount of protest be effective to the larger picture? Sure there could be several independent issue actions, but without coordination, shared purpose, and integration, the groups likely will remain small and weak – fragmented. A larger view struggle is what we all face. And it demands a larger than activism view and structure. Trying to address each problem on its own is how these things have been done, and I think with what I see, this larger multi-topic set of issues, does demand larger thinking and planning for larger action. The loss or absence of coordination by choosing the individual separate approach is a strategic and tactical blunder all around. George Lakey has mentioned in “Break out of your class bubble, get training and win!” about, and I paraphrase somewhat, increase the skill sets and diversity of members, or broaden the base to include those people typically not considered because of their political past. Folks, if these issues are indeed as tough to solve conventionally with government, then new ways should be considered imperative. My concerns are absent of politics, as I understand myself and politics. I recently wrote articles about how the character flaws and circumstances of our warriors-in-chief have throughout our history turned them into deadly warriors that have led to over 2 million humans being killed. I ended the articles with some remedies. The one ii want to mention here is adopting an alternative voting system and grooming female progressive candidates. Do you know of any U.S. male president?